Workshops are a way to reach new communities of students who cannot get to a weekly class. They’re also a great way to explore a topic in more depth. 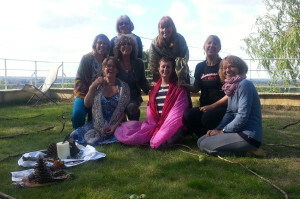 Retreats are time to drop out of mundane life and into shared space, where we can really enjoy our yoga together. In the past, I have led workshops and retreats on such themes as: charity workshops, deep relaxation afternoons, partner yoga, family yoga and seasonal rhythms. I have often led a handful of such events each year, but recently my doctoral research hasn’t left much time to plan and run these kind of extra-curricular activities. But I still love the depth of focus that’s possible in a workshop or retreat setting. So if you already run events and would like me to come and offer a session or two to help out, I’d love that. And if you are at the heart of a studio or yoga community that’s interested in my work, I’d be very happy to come and run a session on a theme we can decide together. Or if you have a group of people you think would like a gentle introduction to yoga, I can come and do that too. These are great ways for me to connect with other like-minded people, spread a little love, and learn about other forms of practice. If you have a studio or yoga community that’s interested in these or other more introductory yoga workshops and would like me to come and spread a little love, contact me!